This is my first "one"--my first DIY maxi skirt. 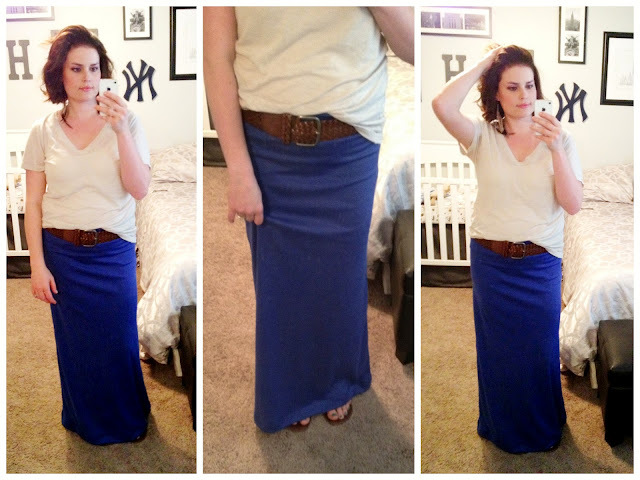 I've been looking at maxi skirt tutorials for while now, and hadn't really found one to my liking, so I decided to figure it out on my own. I enjoy sewing, but sewing from scratch has never been my strong suit. Turns out it is super simple, and now I don't know why I was so intimidated. I included instruction below on how I did it. 1. Fold your fabric in half with right sides together. Make sure the stetch of the fabric goes across your body from hip to hip, not down your body. You want it to stench over your hips so you can out it on. 2. Cut the fabric in half at the fold. 3. Lay your preowned skirt on top of the tissue paper and using the chalk trace the waistband. Cut this out and pin it to the top of your fabric. This will let you know how wide to cut the top of your skirt. I didn't bother adding any length on for side seams because knit fabric is so forgiving it doesn't matter if it is slightly smaller because it stretches anyways. NOTE: You could just measure your waist with a measuring tape, but if I don't have to work with numbers I will avoid it. 4. Measuring how long you want your skirt to be + some extra for the hem and the waistband you want to make. I like thick 1" hems, and I added about 3" to the top for the waistband. Using a tape measure, and taking all your measurements in to consideration, draw out the skirt. Using chalk, taper the fabric out from the waistband down to the bottom. Think of it like making a big triangle. I used the full width of the bottom of the fabric for the bottom of my skirt. You want it to be wide so you have enough room for your stride. I didn't really get too mathematical here. I just freehanded it. NOTE: I was originally going to use the waistband I created by sewing it onto the top of my skirt to make a thick waistband for extra stability. I decided against this as the way I ended up making the waistband was sufficient, but it's always an option. It could work as a yoga-like fold over if you make it thick enough. 6. With right sides of the fabric together sew up the sides of your skirt. I used a 3/8" seam. 7. Try it on inside out. At this point, make sure it's as tight as you want. If you want it tighter go back and sew a larger side seam. 8. Create waistband: while it is on inside out, fold the top of the skirt down a few times to create a waistband. You can make this however thin or thick you want, but remember you still need to hem it so don't make is so big you lose length. My waistband is about 1" thick. Make sure the waistband is even all the way around your waist. Pin it in place while it is on you. 9. Slide is off and sew down the waistband you just created. I just lined the foot of the sewing machine up with the bottom of the fold (waistband) I just created and sewed all around. I used elastic thread for the waistband so it will stretch easily. Find out how to use elastic thread here. 10. Put your skirt back on to make the hem. I don't do anything fancy here. I just bend down fold it under and pin it a few times in front, then stand back up straight to see if I need to make adjustments. Once you have it pinned to your liking take it off and pin it all the way around and then hem it. NOTE: I recommend trying it on with the shoes you intend to wear with it. If you will wear it with high heels and wedges you'll want to take that into consideration because, therefore, you'll want your skirt to be longer. If anything is unclear leave a comment and I will clarify. Thanks! Cute skirt! Okay I know this is a random question, but I was wondering how you got text on the bubble frame app? I have searched everywhere for it. Please let me know. Thanks so much! What do you mean don't pull the fabric? Do you just let the walking foot feed the fabric through?